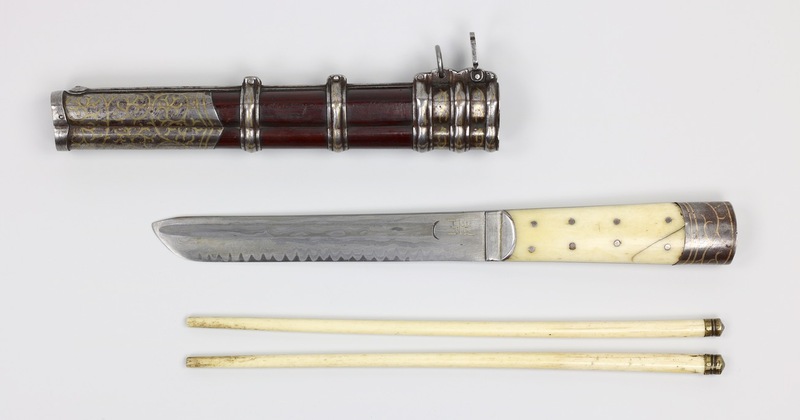 Sets with a knife and chopsticks -and sometimes some other utensils- were common all over the Qing empire. The various cultures that coexisted within this realm gave their own twist to the design. Under the Qianlong emperor the wearing of these sets became mandatory for all Manchus and Mongols. The rationale was that these knives facilitated the traditional style of meat eating, cutting it straight from the bone. This was in contrast to the Chinese method of eating, where the food was pre-cut into bite sized pieces that could be eaten with chopsticks. In an attempt to preserve the rough outdoor nature of the Manchu and Mongol lifestyles under the Qing, it was illegal for them to have their meat pre-cut. 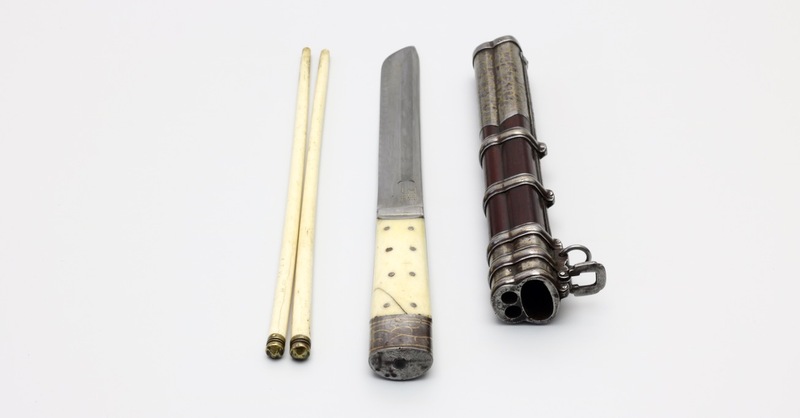 And so, all Manchus and Mongols were required to wear these trousse sets to eat their meat in a traditional way. A high-quality example, its single fullered blade is forged folded using layers of milder iron and steel around a high-carbon edge plate. 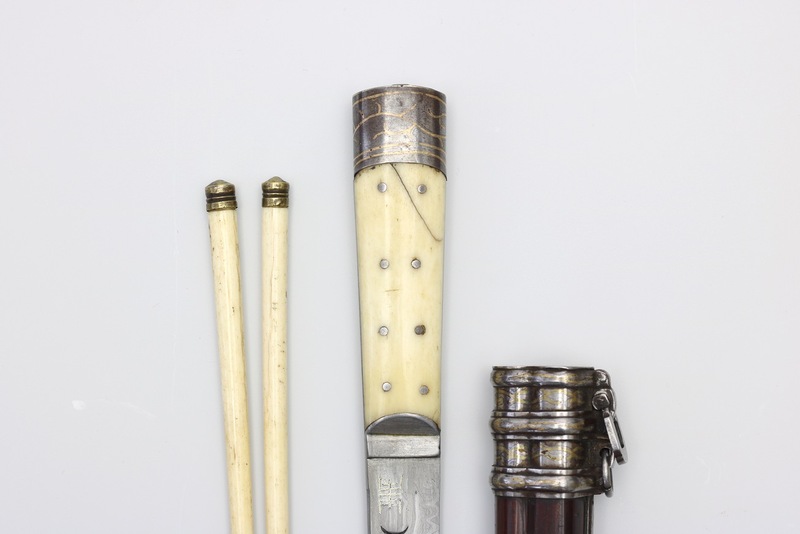 The edge exhibits a serrated pattern, referred to by collectors as 馬齒 ( machi ) or "horse tooth". It is accomplished by bending the edge up and down alternatively and then polishing it smooth again, revealing layers underneath. On this example it is very well down, showing excellent control by its maker. 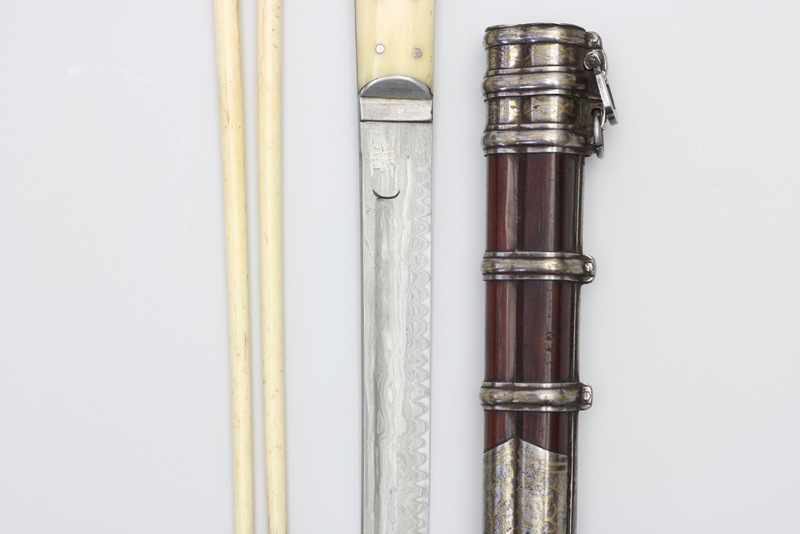 The blade further has silver inlays at both sides of the forte of a stylized 壽 ( shou ), meaning "longevity". The back of the blade is ridged. 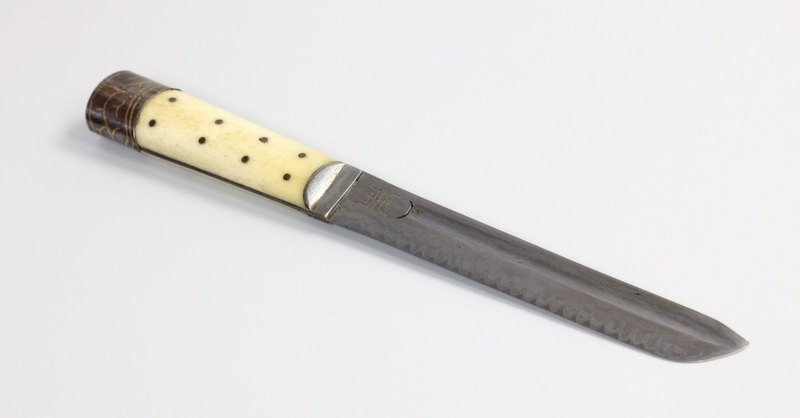 The handle consists of two bone plates riveted to the wide tang. 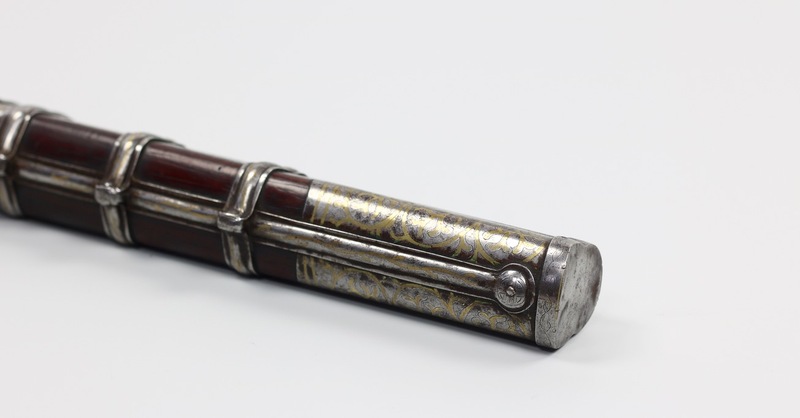 The fittings are something else as well: The pommel is made of steel with motifs of vines, engraved and inlaid in brass. 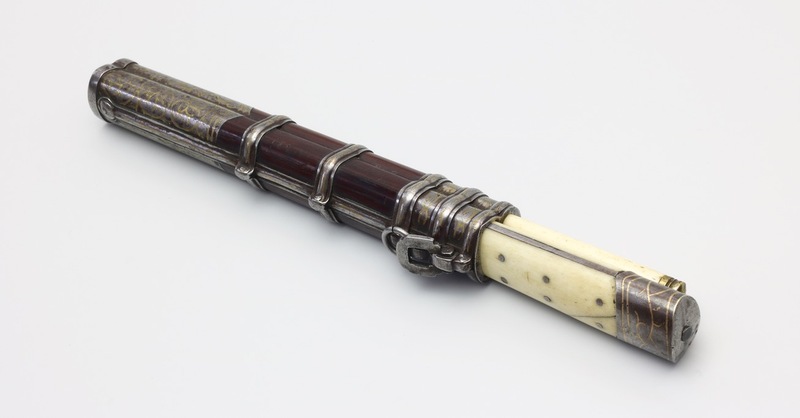 The scabbard is made of precious red hardwood, with fittings matching the knife's pommel: all engraved and inlaid with patterns of scrolling vines. 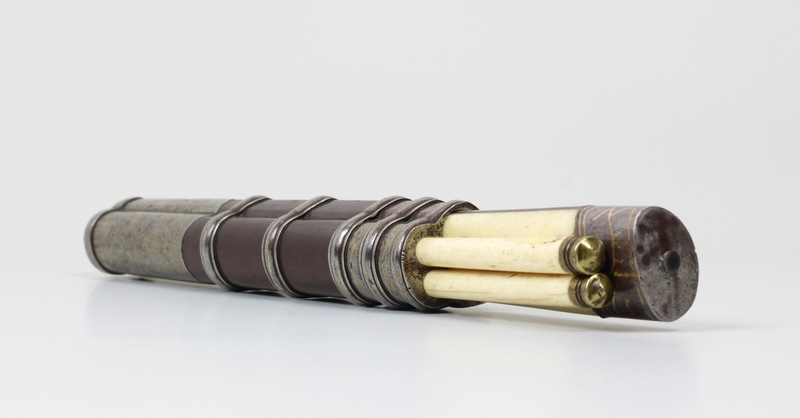 It comes with two bone chopsticks with brass finials. Superb fit and finish on all components. 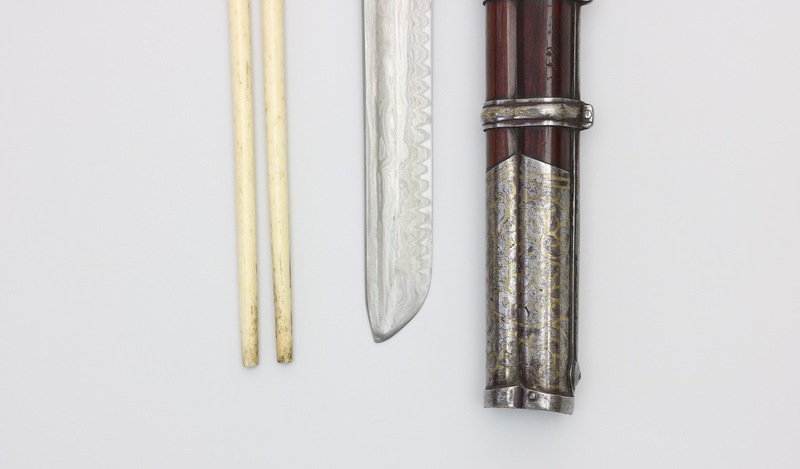 The rather short, wide blades are associated with northern China and Mongolia. This example is not of tribal workmanship and was probably made in a metropolitan area in this region, possibly for the Mongol market. Blade in new polish, revealing its complex forging structure. 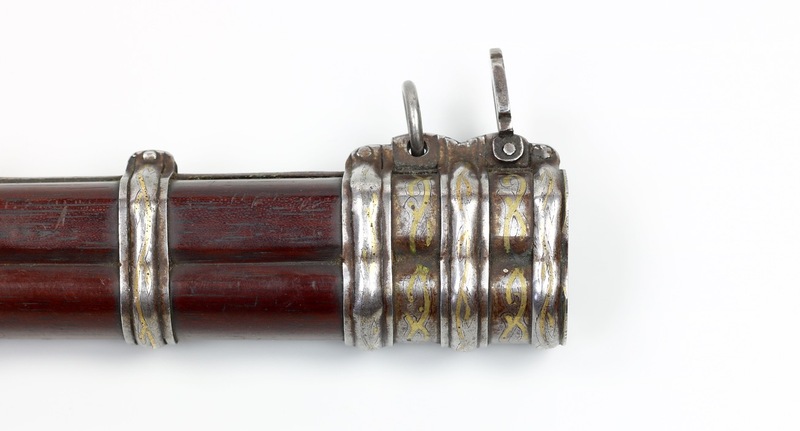 There is a dent in the back of the pommel cap, and the tang end was lost. This is now replaced with a new piece of metal, darkened to match. Otherwise complete and in excellent, original condition. 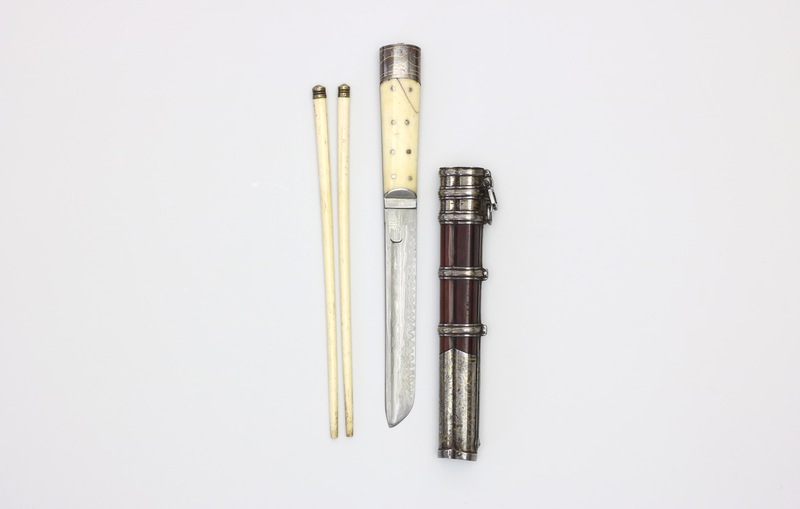 A very rare and high quality trousse set with horse-tooth patterned blade. 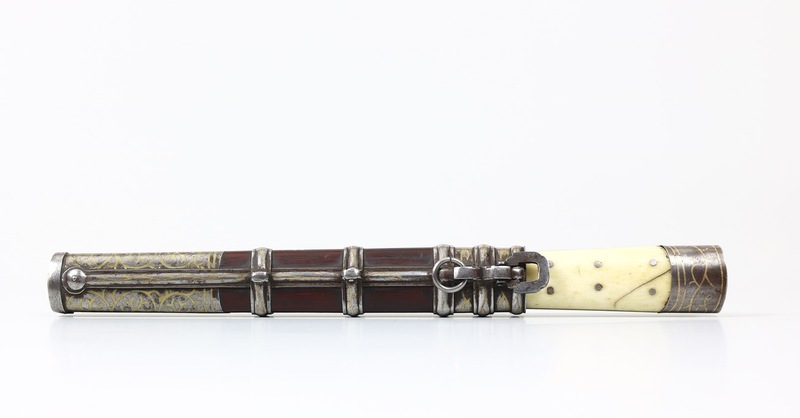 It comes in a set of heavy steel fittings, engraved and inlaid, in classical Chinese scrolling vine patterns. A rare piece, in very good condition.